Have a look at the latest addition to the family which is Popeye. As strong as an ox and ready to hit the road. Popeye is in great condition but still needs to be looked after. Popeye has duel fuel running on gas cuts your fuel bill by at least a third. He has stove, fridge, sink lots of storage and bunk bed room for 3 adults or 2 adults and 2 kids. 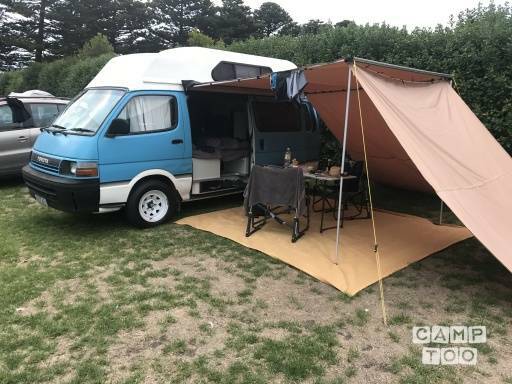 Very clean tidy and unique van, get to know Popeye on your adventures. Get in touch about Popeye. NB: 20 of Dec to 20th of Jan. Minimum 3 weeks rental required. These campers being vintage are kept very well and look cool because we care for them and the people who borrow them do too. You just want to look after them when you meet them. No smoking inside of course, they have outdoor covered space anyway, not keen on carrying of dogs after experience. Would rather they are camped in a Camp ground of course but the odd nights at free legal camp spots is.